Basketry is one of our oldest crafts. It is likely that every culture has used plant fibers to make containers and other utilitarian objects. In some cultures the artistic impulse of the people as well as economic necessity has transformed these useful household items into works of art sold to both individual and institutional collectors in the outside world. 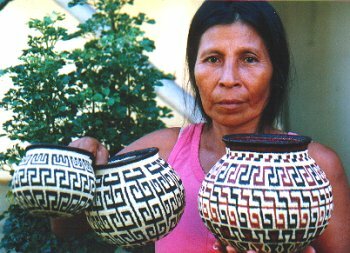 The Wounaan and Emberá women of Panamá have recently taken their traditional basketry skills and refined and developed the craft to produce some of the most unique and finely wrought plant fiber art to be found among modern basket artists. Each Wounaan or Emberá basket is a one-of-kind piece and is the result of many hours of labor as well as an expression of the artist's own individual talent and artistic vision. The basket is also a repository of cultural information. Basket designs often incorporate religious symbols or representations of cultural artifacts or the artist's natural environment. Her patterns are in her soul, in her memory and imagination, in the mountains, watercourses, lakes and forests, and in those tribal tales and myths which dominate the actions of every hour. She hears suggestions from another world. Recently Wounaan and Emberá women have begun to cater to foreign basket buyers who often prefer non-traditional baskets with bright pictorial designs. While some of these picture baskets feature animals, plants and birds of the rainforest, others depict scenes that the basket maker has seen only in pictures - underwater coral reef scenes for example. These colorful “tourist” baskets usually exhibit great technical skill and are beautiful pieces of art but don’t always reflect Wounaan and Emberá culture. 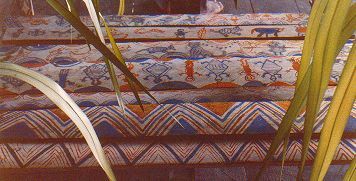 Older geometric or simple figure basket designs, on the other hand, have cultural meaning that is often derived from traditional body painting designs used in puberty or curing ceremonies or designs painted on boats and altars to facilitate communication with the spirits. A Wounaan or Emberá basket starts with harvesting the basket materials. Decorative baskets are made from two types of plant fiber although utilitarian baskets may utilize other plant fibers as well. 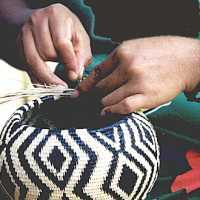 For the decorative coil baskets made to sell to the outside market Wounaan and Emberá women harvest their materials from the chunga or black palm (astrocaryum slandleyanum) and the nahuala or "panama hat" plant (carludovica palmata). Material harvesting often requires a long and sometimes dangerous trek into the rainforest. Many areas surrounding indigenous villages have been deforested by commercial logging operations making materials scarce. To make harvesting expeditions even more arduous harvesters are often attacked by roving delinquents. Civil unrest in Colombia is spilling over the border into the Darien province of Panamá making life difficult for the indigenous residents of the area. Many villagers have even migrated to Panama City fleeing violence in the Darien. Ill-suited for city life and urban jobs, women migrants depend on the sale of baskets to support their families but are increasingly finding it difficult to obtain the raw materials to continue their work. They often have to travel back to their villages to buy materials to bring to the city. Scarcity of raw materials is becoming a serious problem as more and more women make and sell baskets. Fortunately, reforestation projects of chunga and nahuala are starting as the economic importance of these trees is recognized. more about baskets . . .